Speedwell is a Vertue (no. 44), designed by Laurent Giles and built in 1952 in Hong Kong. She is 25'4" LOA with a 4'6" draft and 7' beam. 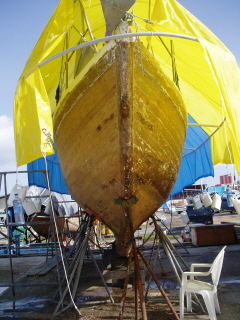 Originally bermudan rigged she was converted to junk rig in 2004. 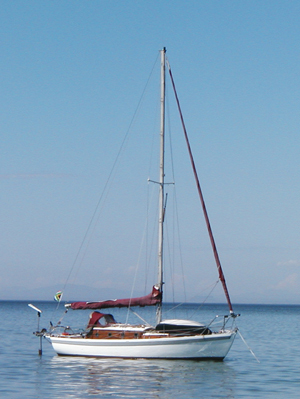 Built of teak planking on camphor frames with a cast iron keel. I bought Speedwell in December 1998 as a Christmas present for myself. She was on a mooring at Saldanha Bay Yacht Club on the West Coast of South Africa and hadn't been sailed for many months. Not good for an old wooden boat. I sailed up to Port Owen a bit further up the coast where my good friends Pete and Annie Hill were building their catamaran "China Moon". They gave me invaluable help, advice and encouragement. The first job I did while still afloat in the marina was to cover the deck and cabin top in fibreglass and epoxy to stop the rain from getting in. Once Speedwell had been lifted out by the crane I was fortunate enough to be able to move her inside a wonderful boat shed after having removed the mast. I spent the winter doing all (well at the time I thought it was all) the jobs that needed doing before setting off. This included replacing the keelbolts, all standing rigging, new self-tailing sheet winches, installing an anchor windlass, a new forward hatch, cleaning and painting the bilges, removing the heads and doing away with all unnecessary seacocks and holes in the hull. I replaced all the wiring and installed new batteries. The engine was refurbished and a new prop shaft fitted. I opted to keep the galley very simple with a platic basin instead of a sink which I empty over the side. My cooker is a single burner primus stove sunk into the counter on a gimballed ring. I had been fortunate enough to find a second-hand Navik windvane which was fitted. Finally a new coat of paint and varnished cabin sides and she was looking very smart. When I bought Speedwell she had an old 8HP Yanmar single cylinder diesel engine which was still serviceable, but I had endless problems with diesel leaks and air getting into the system. The main problem seemed to be that the engine was rigidly mounted in a boat that was anything but rigid. Getting the motor to start usually involved a 20 minute session of bleeding the air out of the system. Then so much water would come in via the stern gland that the bilge pump wasn't able to cope. So it wasn't practical to motor for more than about half an hour before the floor boards started floating. Something had to be done. I had left Speedwell in Jacaré for a 8 months while I crewed for Pete Hill on a trip to Tiera del Fuego and when we returned, after some exciting times, and Pete was repairing his boat in Mar del Plata, I travelled overland for a few weeks and passing through Buenos Aires bought a new Vetus diesel engine which was on a special offer. It was trucked down to Mar del Plata and when Pete and I sailed back to Jacaré it came with us as deck cargo. Pete helped me remove the old engine and install the new. With flexible mountings and coupling it has proved to be a very happy improvement. During the crossing from Cape Town to Brazil in 2002 I found that she was leaking rather badly and needed recalking and refastening to improve the situation. Not having the necessary skills to do this myself, or the money to pay someone else to do it, I opted to sheath the entire hull in fibreglass and epoxy. This has proved to be completely successful (much to the tradionalists' disgust). My slow progress through the Caribbean forced me to return to Trinidad to wait out the hurricane season in 2004. While in Chaguaramas I decided to use the time to do the job. It took some time as once the paint had been removed I had to clean out all the seams and refill them with a strong epoxy glue mixture. The hull also had to be given a chance to dry out before the glass could be applied. This was not easy to achieve during a Trinidad rainy season. I used West System epoxy and applied 2 layers of 16oz biaxial glass cloth with mat backing. The epoxy work had to be done very quickly in the damp heat and for this part of the job I needed a helper. The two of us were able to finish the actual glass and epoxy work in 5 days (not consective). The glass cloth was 50 inches wide and we hung full width strips from the toe rail to the top edge of the cast iron keel. I opted not to encapsulate the keel as I felt it would be impossible to completely prevent rust forming under the glass. 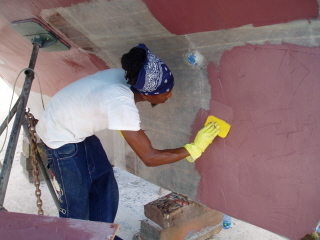 It is easier to treat rust if it is only paint that needs patching up. As each panel of glass was hung a layer of epoxy fairing mixture was applied and smoothed out. The chap helping me was quite an artist and produced a surface that needed a minimum of sanding once it was dry. I did the sanding myself with an orbital sander. A very messy, dusty job. I tried wearing protective clothing but in that heat I sweated so much that my glasses instantly fogged up. I admitted defeat, stripped down to t-shirt and shorts and just rushed to the convenient shower to wash off the dust whenever I took a break. I did wear a mask over my nose. 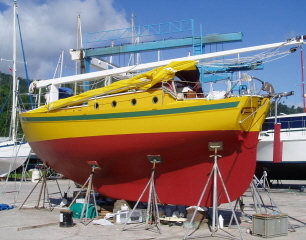 When it came to repainting the hull I decided to break away from the conventional look and chose a cheerful yellow with a dark green stripe. I have been very happy with this choice of colour and apart from making me feel good each time I look at my boat from a distance, it is very visible at sea. After having sailed for some months with Pete Hill on a trip down to Tierra del Fuego in his junk rigged catamaran China Moon I was firmly convinced of the advantages of this rig. It seemed that now was a good time to convert Speedwell. Pete was in Cape Town having returned from a single-handed voyage to Antarctica and agreed to make a mast for me and deliver it to Trinidad on China Moon. The boatyard fundis had something else to shake their heads over. 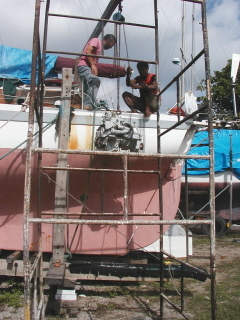 Sometime in November, 2004 while I was busy sanding away before painting Speedwell, Pete arrived with mast. And started the non-trivial job of converting to Junk. My old aluminium mast was removed - it had been deck stepped so this did not create too much of a problem. 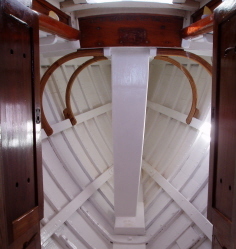 The new wooden unstayed mast was to be fitted to a tabernacle which had to be stepped on the keel. Four knees were laminated and fitted to provide additional support. I lost some room in the forepeak as I had had a nice spacious v-berth. Nowadays I sleep athwartships and only have to bend my knees a little. Of course this is only when anchored. At sea I sleep in the main saloon. As can be seen in the picture, the base of the tabernacle was cut away slightly on the starboard side to alow easier access past it. Above deck the tabernacle provides a convenient place to mount my anchor windlass at waist height which makes raising the anchor much easier on the back than it's previous position on the foredeck. I chose to use PVC laminated cloth for the sail. Not very easy to sew with, but cheap and very strong. Four years later it's still looking pretty good. 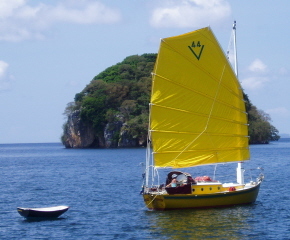 The design of the sail is that of Vincent Reddish as used on his Vertue. I was unable to find the right size and weight of aluminium tubing to use for the battens in Trinidad and Pete made the 17ft battens from oregon pine. Unfortunately the wood had a few knots and about a year later I had to replace them with aluminium battens. I have now reinforced these with unidirectional carbon fibre and have had no further problems. I spent a fairly traumatic year experimenting with jointed battens and personally feel happier going a bit slower to windward, but not having to worry about joints popping apart when the wind picks up.